"thank you for the passage and commentary"
Great shot. It is beautiful. That's beautiful and I like the photograph of it. Thats an oldie but a goodie;) Happy WW. Classic yet beautiful in style. 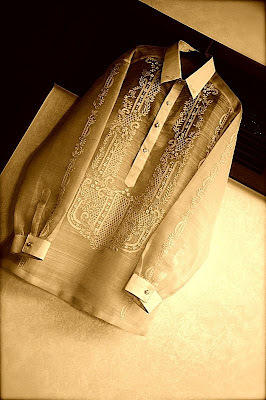 Yup, this is a "barong tagalog" which is a tradition Filipino clothing. He wore this during our wedding last 2007.
very classic and very formal! thanks for the visit! What a beautifully embroidered shirt! It looks like it's made of Pina. Ganda no!